Imagine you and an old friend from high school are lying on a trampoline in your backyard. Cucumbers cover your eyes as you soak up rays from the rising sun. It’s been almost a decade since you’ve talked, so naturally one of the things he asks about is your job. Could you define it? And could you do it in 60 seconds? If not, no worries. We’ve got you covered. 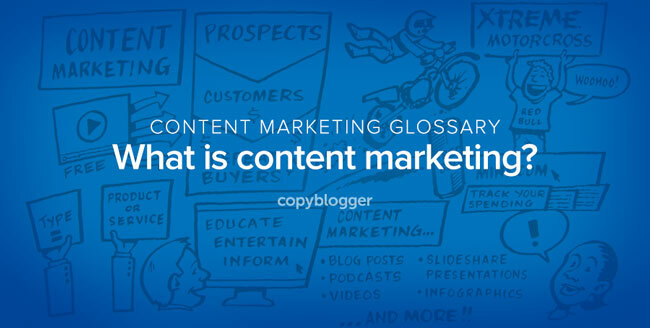 Last week, we announced the publication of our Content Marketing Glossary. It’s a resource to help you quickly answer any questions you might have when it comes to new words and concepts in content marketing. With help from our friends at The Draw Shop, we whipped up 12 definitions into 60-second whiteboard animated videos. The type of content you share is closely related to what you sell; you educate, entertain, or inform people so they know, like, and trust you enough to do business with you. Red Bull’s content marketing focuses on videos of extreme athletes. They also happen to sell an energy drink. People who are interested in extreme athletes may also be interested in an extreme energy drink. Mint.com publishes articles about personal finance that help attract people interested in that topic, and this helps build their business. Content marketing can take the form of blog posts, podcasts, videos, SlideShare presentations, infographics, and more. If you’re creative, the possibilities are endless. This was GREAT! I love what you folks are doing with the Glossary stuff. The timing is perfect. I actually just connected with Mary from WriteToDone and I’m going to be putting together an article for her amazing site on this exact topic. I’ll be sure to link to that video. Looking forward to seeing that article, Aaron. Amazed to learn about the content marketing definition in 60 second compact video. Loved the draw shop too. Short and helpful article on content marketing putted in that Draw Shop video. True reminder about the core of content marketing, and all that we can do with it. I would like to include this explainer video into that post for some added pop. It’s all about saving people time with videos and infographics, right? I’m new to all this but am working for a new company and need to know all there is to know. I enjoyed the video and will be looking through others to try to learn more. Excellent video! I wish I could share video directly to social; multiple clicks, leaving an app and scrolling is too much of an ask for a 60-second video, though. Is there any way we can make this content more shareable? Going to really review and think about this for my personal site. Thank you. It’s a good little reminder to the key aspects of content marketing and how important it can be, in terms of converting prospects to customers and turning those customers into repeat customers. Great! But why does it need to be free? Really Great Article! Without content marketing my business would be in obscurity. Its so important to understand content marketing and why it is necessary. I have an Internet Marketing business and we specialize in SEO. Content is such a huge part of what I do. Thank you for the article! Thanks for Information about Content Marketing. Your Article is impressive and very informative. I am now regular visitor of your website and bookmarked it. This video is simply awesome. This exactly elaborate what we blogger do in our day to day life. It is hard to explain to others but this video tells everything in 60 seconds. Thanks Demian for this amazing video. We all need to find ways to be more productive and find more time for the things we need to do and there is some great information in this video to help with that!